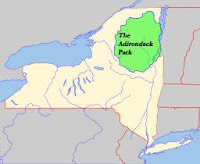 There is an effort underway to petition the social networking site, Facebook, to add a group for us Adirondackers. It is true that we "don't live in Albany, we don't live in Burlington - we certainly don't live in Montreal. What's an Adirondacker to do?" It is pretty clear the Adirondack Lifestyle is not just like living in Montreal, or Albany, or even Burlington for that matter. So, get with it Facebook! I learned about the effort from my friend at Paul Smith's College, a four-year school notably referred to as the College of the Adirondacks. Even though there only about 132,000 of us living within the blue line, many of us identify very closely with this special lifestyle which is why we choose to live here. I know it is not the most important and profound Adirondack issue about which to blog, but hey, I have my niche.